How do I design my small space to feel larger and more functional? More often than not, living in the epicenter of a city means sacrificing square footage for location and convenience. Many city dwellers find it a challenge to make the best use of limited spaces without sacrificing on style and functionality. Here are some tips we can hopefully all benefit from, whether we’re living it up in the city or dealing with cramped living quarters in general. 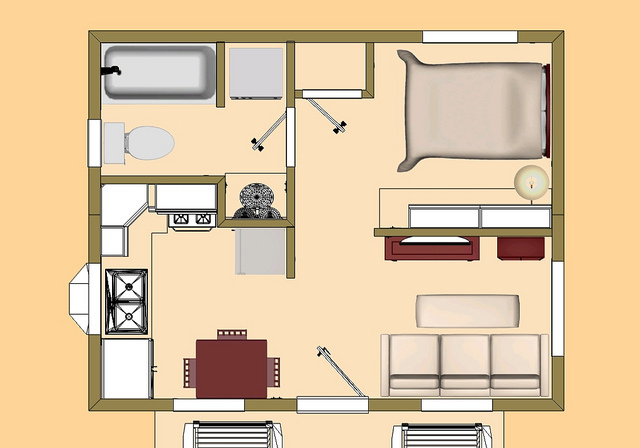 Small floor plans can be difficult to arrange and organize. The most important thing to consider when designing for a small space is to choose furnishings that are proportionate to the size of the space. An oversized sofa or recliner may be comfortable, but in the long run will end up making your space feel even smaller and less functional. There are so many scaled-down options out there, especially in modern furniture, that offer comfort in a smaller footprint. If you have a little more space and want extra seating, a modular sectional is a good option. They can be separated or arranged for multiple scenarios from entertaining to sleeping house guests. Also, if your living situation isn’t permanent, they offer a non-committal solution that can work elsewhere in the future. Another thing to keep in mind, is that arms can create barriers making spaces feel closed off. A lower arm or armless option can prevent this, as well as an open ended sofa. Long gone are the days of uncomfortable and unattractive sleepers. They also function much easier than in the past, with the added benefit of not having to remove and store loose cushions elsewhere. Clockwise L – R 1. Clip ottoman with tray, 2. Open acrylic bar stool, 3. Alice sleeper sofa. All available through NESTModern. 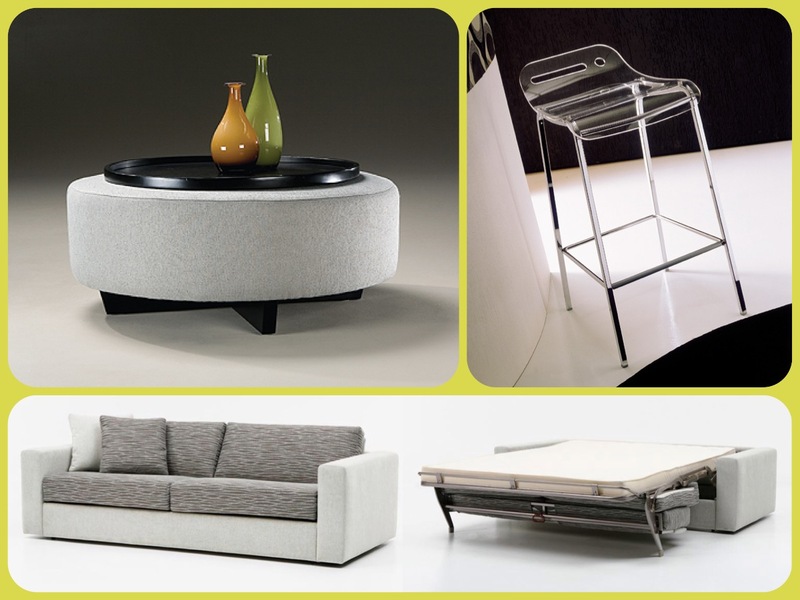 Ottomans are often a great coffee table alternative because they are multi-functional. Great for kicking your feet up, they can also be used as a table with a tray on top, or extra seating. If you prefer a solid surface, clear, seamless glass coffee tables don’t add visual clutter to a cramped space. Combining these two options is sometimes the best solution. A glass coffee table with rolling ottomans underneath, can work as casual dining or a game table. For side-table, C-tables, tables that hook over arms or can cantilever over seat cushions, are a great option that won’t impede traffic flow or use valuable space beside your sofa or sectional. In studio apartments, finding an attractive way to define spaces can be challenging. Bookshelves are perfect as room dividers, not only because they offer storage and opportunities for displaying items, but because their openness keeps things feeling airy and not completely closed off. Speaking of storage, the more closed storage you have, the better. A cabinet with doors that doubles as a media unit is a simple solution for hiding things and keeping clutter at bay. For dining, clear acrylic bar stools have the same effect as the glass coffee table discussed above. Their translucency allows them to disappear and not use up valuable visual space. An extendable dining table can be opened to entertain, then closed and pushed against a wall for use as a desk or console. Hopefully these tips are helpful if you find yourself living in the confines of limited square footage. With a little bit of careful planning and consideration you can make your place feel and look a lot larger than it really is! ← How can I have a modern interior that is comfortable?